Guests had the unique opportunity to dine on dishes prepared by celebrated chefs, while sipping on wine specially paired with the multi-course menus. These exclusive dinners offered guests the opportunity to interact and have a truly personal experience with culinary masters. Bobby Flay and Giada DeLaurentiis, two of the world’s best known chefs, collaborated for “When Stars Align: Master Series Dinner with Bobby Flay and Giada De Laurentiis” dinner at Mesa Grill. In true stardom style, the meal was comprised of six-course menu filled with flavor. The specialties featured at the dinner included steamed East Coast halibut, stuffed lamb chops with walnut gremolata, lemon-smashed fried potatoes and espresso bread pudding to finish off. 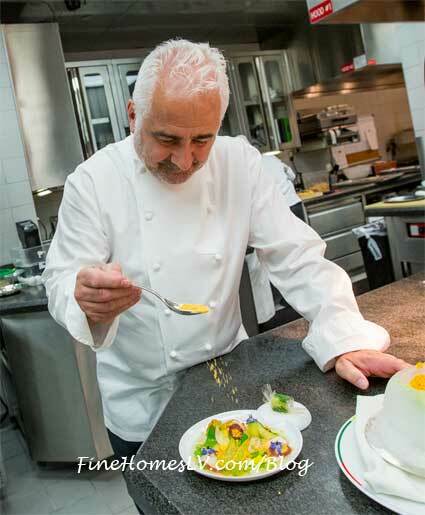 De Laurentiis provided her famed lemon ricotta cookies as a take-away gift to all of the guests. Chef Giada, Bobby and Editor-in-Chief of Bon Appétit Adam Rapoport, welcomed the guests to a one-of-a-kind experience, where truly two stars aligned. Another new addition to the Master Series dinner line-up, Chef Nobu Matsuhisa welcomed his guests for “Global Gourmand” at Nobu Caesars Palace. Critically acclaimed Chef Nobu was joined by Bon Appétit editor Andrew Knowlton in welcoming a full house. Taking the time to speak with every table, Nobu chatted with all his guests prior to the courses being delivered. The seven-course meal consisted of the salmon kelp roll, fluke spinach salad, Chilean sea bass moronic miso, Braise short rib and zuke maguro, finished by the kinako tiramisu, which did not disappoint. 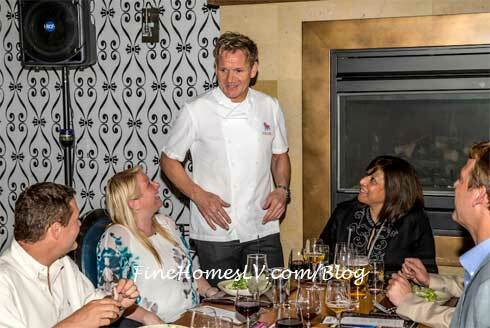 One of the newest addition “A Scot’s Tale: Master Series Dinner,” Chef Gordon Ramsay, who, along with Bon Appétit’s Senior Editor Alison Roman, hosted a six-course dinner with wine pairings at Gordon Ramsay Pub & Grill. Chef Gordon greeted each guest, while the courses were being served. The signature mini steak & ale pie and pan-seared diver scallops were perfectly paired with craft beers including the Well’s Brewery Toffee Ale to compliment the Gordon Ramsay favorite: Sticky Toffee Pudding. Guests had the opportunity to get up close and personal with pastry master François Payard in his intimate dining room for the “French Elegance with Francois Payard” Master Series dinner. The five-course tasting menu featured pan seared Alaskan halibut, short ribs a la bierre and Payard’s signature Palet D’Or for dessert; all perfectly paired with Italian, French and Australian wines. Bon Appétit Senior Editor Dawn Perry, Sr. welcomed guests to the dinner. Restaurant Guy Savoy treated guests to six courses of refined elegance including the famed artichoke and black truffle soup. Michelin Star Chef Guy Savoy interacted with guests during the “Dinnertime Decadence” Master Series dinner and took photos along with David Lynch, wine insider for Bon Appétit. One lucky lady dined at the private Krug Chef’s Table along with her five friends, for a once in a lifetime experience with Guy Savoy being the host of the evening. 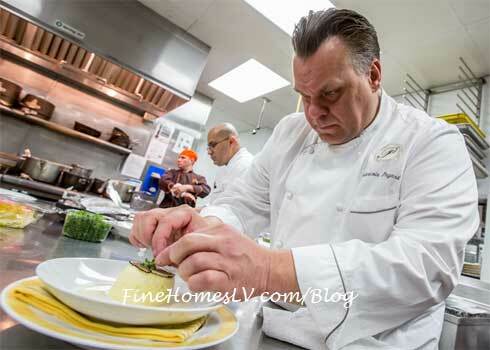 Greg and Marc Sherry hosted a five-course menu filled with Old Homestead staples during the Vegas Uncork’d “The Great American Steakhouse” Master Series dinner. The menu featured pan seared Alaskan halibut, Dry-aged New York Strip along with the numerous seafood canapés being served. The Maine lobster, Kusshi oysters, Dungerous crab, poached shrimp and bay scallops were served with complimenting cocktails and the desserts, left the guests full and happy.